I just spent the last hour getting re-acquainted with a DVD my friend Dave had given me upon my return from Australia. 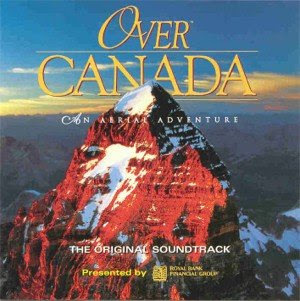 The DVD is called Over Canada and I've found a trailer for it on YouTube: http://www.youtube.com/watch?v=refmdRuvZY8. This visual spectacle was shot by helicopter across Canada in 1999 and revealed to Canadians on New Year's Day 2000 as a celebration as we entered the new millenium. I remember how taken I was with the footage as the helicopter covered Canada, north to south, east to west. In August of 2000 as I was about to depart to Taiwan to begin my life as an English teacher my Auntie Wanda gave me a VHS copy of Over Canada to take with me - so I would never be homesick. If she only knew how many times I would play this video tape over and over again, watching it with fellow ex-pat friends, all of us shedding tears over the homes we had left behind. When I was moving to Australia I wanted to find a copy on DVD so I could have that piece of home with me while I traveled. Sadly I couldn't find a DVD copy before we left and for the 9 months we were abroad, I missed out watching it with Australian friends. Many thanks to Dave who hunted high and low for those 9 months, finally discovering a used copy at a record store. I will treasure this forever. I hope you all enjoy the trailer as much as I enjoy the entire hour of footage each time I watch it. Blogging is almost like an obsession to me now ~ as I creep up on the one year anniversary of "Adventures of a Saskatchewan Girl". I love to keep up with my own little personal bloggy here but lately I've taken on a new blogging challenge with a friend of mine here in Edmonton. Finally test-driven on a group of peers and virtual strangers I would like to share this blog with you all: www.Cdnsinglegirls.wordpress.com. Why this type of blog you may ask? Well I'm branching out creatively, I'm meeting new people, I'm laughing at some of the funny/scary/bizarre dating stories out there and I'm learning more about me. I hope you all visit this new blog and I'd love to hear some of your feedback. Yes, I know, the Olympics are well past ~ I should move on. Realistically though I think Canadians will be basking in the Olympic glow for quite a long time yet (I know I still am). On Monday the Saville Sports Centre here in Edmonton held an Olympic celebration event, feteing the gold medal winning Kevin Martin curling rink. My friend Felicia and I went to get as close to the gold medals as possible and also to catch up with third John Morris as he's now the most eligible bachelor in Canada. I'd say we got pretty close to ALL of the team members (as evidenced by the photos)! And can I just say, those gold medals are HEAVY. Felicia and were impressed at the level of patience and professionalism these gentlemen demonstrated as they dealt with fan after enthusiastic fan. Each time we approached one of the team members they always had time to make small talk with us and pose for a photo. Really impressive guys! It was the closest I think I'll ever get to a gold medal again and for that one brief evening I felt like had been to Vancouver and back with the team. Many thanks again gentlemen for the amazing curling season and for the fantastic celebration you put on the other night! This Easter feels like I've come a bit "full-circle" ~ setting out from Saskatchewan and moving back to Alberta a year ago. It was the first big holiday I went home for after starting my new job last year, and it brought back good memories this year as I headed back home to SK to spend time with my family. The weather was divine all weekend long, sitting in the +10-15 range, unheard of for early April in Saskatchewan. We celebrated with long walks, wiener roasts around the fire pit and downing some beers on the deck. We had my grandparents over for the family meal on Easter Sunday and my grandfather brought with him my next epic adventure. I am teaching myself how to play violin and to help out, my grandfather is lending me his first violin that he bought for $25 when he was 20 years old, ordered from the Eaton's catalogue. I am going to practice every day and already can do a passable set of scales and a rudimentary Twinkle, Twinkle, Little Star. I love going home! Lately I've been feeling like this blog isn't living up to its name very well. I am a girl from Saskatchewan but lately all of my "adventures" have been in Edmonton or back at home with my family. Fun yes, adventurous not really. I'm happy to say though that there will be a big new adventure coming at the end of the month. I'm going on a 3-day cruise to the Baja Peninsula in Mexico with two great friends from Calgary. We've got a few days in L.A. as well so there will be plenty of photos and stories coming soon. I can hardly wait!